Award-winning author Grace Lin joins science writer Ranida T. McKneally to get kids talking about the science of food, the five food groups, and what a healthy meal looks like. Answering questions like "why are so many vegetables green? ", "What's the difference between brown bread and white bread? ", and "Why do beans make you gassy? ", cheerful haiku poems and a simple Q&A format make this book a nutritious treat. The information in this book aligns with both the USDA's MyPlate guidelines and the Harvard School of Public Health's Healthy Eating Plate guidelines and back matter includes further information about healthy eating and nutritional guidelines, as well as a glossary. Ranida T. McKneally is a writer and science editor who works in educational publishing. She also co-authored Our Seasons with Grace Lin. She lives in Medford, Massachusetts. Grace Zong is the illustrator of Goldy Luck and the Three Pandas and Orange Peel's Pocket (Abrams). She splits her time between New York City and Korea. This scientifically based exploration of the five food groups showcases their components and nutritional relevance by posing and responding to questions kids frequently ask. Briefly explaining why we eat, the text examines each food group: fruits, vegetables, grains, protein foods, and dairy. After defining a fruit, listing examples, and discussing their nutritional value, the text investigates what makes fruits sweet and colorful. The vegetable section opens with the difference between fruits and vegetable and moves on to why many vegetables are green and why it's important to eat vegetables. Describing "what makes a grain a grain," the text explains the difference between brown and white breads and "what makes popcorn pop." Protein foods are discussed as important building blocks followed by explorations of why lean meats are healthier than fatty and "why do beans make you gassy?" The final, dairy-group section explores the sources of milk, its composition, and nutrients as well as the difference between whole milk and skim and "why are some cheeses so stinky." The clearly written, fact-based text concludes with advice on balancing food groups. Each double-page spread features a haiku that encapsulates the topic or subtopics explored and a prose sidebar that goes into detail. Colorful, acrylic illustrations featuring five inquisitive, racially diverse kids exploring food production on a farm add visual focus and lighthearted humor. 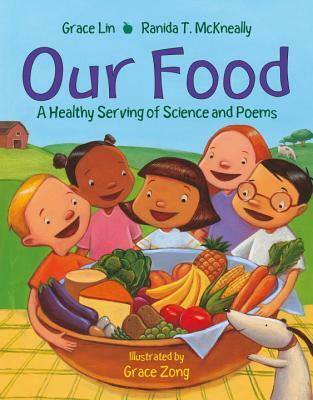 Playful poetry and palatable prose provide a useful, kid-friendly introduction to nutrition. "Breakfast, lunch, dinner-- / Every day, we eat and eat. / But I'm still hungry!" Newbery Honor-winning Lin and science author McKneally join forces with illustrator Zong to explore the five food groups--fruits, vegetables, grains, proteins, and dairy--as well as the nutritional balance needed to give children energy and keep them healthy. Taking up half of each two-page spread, Lin's child-like and often pun-laced haiku (i.e., "I've always wondered: / Do brown chickens lay brown eggs? / My thoughts are scrambled") will appeal to younger audiences. Side panels contain McKneally's intriguing responses to questions such as, "Why do beans make you gassy?" and "Why are some cheeses so stinky?" which are perfect for older readers and might even capture the interest of adults. Zong ties both narratives together with brightly colored acrylic depictions of playfully inquisitive, ethnically diverse children. McKneally closes with an acknowledgment that not all scientists agree on what constitutes a healthy meal, which emphasizes how changeable the landscape of nutrition guidelines can be. Includes a fairly comprehensive, one-page glossary of food terms. Simple haiku offers a light accompaniment to colorful pages introducing the five food groups and the benefits of nutritional eating. Each of the five groups is broken into topics within the subject--"What is a fruit?," "What makes fruit sweet?," and so on. Bright, cartoonlike acrylics depict a diverse group of children exploring the natural world of food (an orange grove, a vegetable plot). Aligned to the side of each spread, an opening haiku and a chatty, readable paragraph provide further information. The cheerful and informative whole will delight classroom teachers and parents who homeschool alike--a neat, vibrant shopping cart full of attractively packaged explanations on food, diet, nutrition, and health (plus a word to the wise on why beans are "gassy"!). This work is simpler than Kim Etingoff's textbookish On My Plate: Building a Healthy Diet with the 5 Food Groups and DK's colorful, more detailed Are You What You Eat? VERDICT This title will slip gently into the curriculum with nary a bit of fat or gristle to be seen. Lin's often pun-laced haiku pair with McKneally's intriguing responses to questions such as, "What's the difference between a fruit and a vegetable?" and "Why are some cheeses so stinky?" to explore the five food groups and the nutritional balance needed for energy and to stay healthy. Bright acrylic depictions of playful, diverse children tie the narratives together. See also Saraj L. Thomson's What's for Lunch?